Can You Smell What Deadprogrammer’s Cooking? I’ve read an article (though I can’t remember who wrote it) about the fact that many gourmet foods are initially repulsive to most people. The first signal your brain sends you when your are having oysters, stinky cheese, scotch or caviar is “Dude! This stuff is spoiled, spit it out right now!”. But then, you consciously think, “Come on, brain, this is 25 year old Talisker we are having here. I just paid $225 for the bottle, you better relax and try to enjoy it. Yes, I know that it tastes like peat a little bit. It’s supposed to. It’s a good thing”. 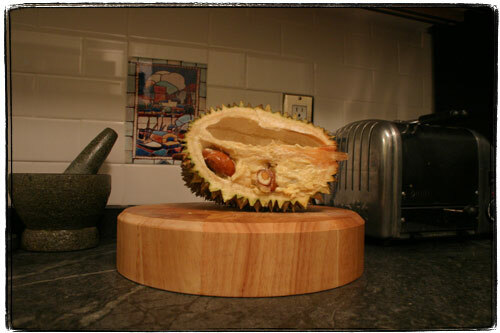 The ultimate gourmet food for which you need to fight with your brain is Durian. Available in most oriental stores in New York, this pointy skinned exotic fruit is widely known for smelling awful but tasting heavenly. Recently I purchased one on my trip to Avenue U, which is more and more becoming Brooklyn’s Chinatown. Here it is, sitting innocently on my Naked Chef-style cutting board. When you cut it with a knife, you find several sections filled with custard-like flesh and big seeds. I have to say that the smell was not as horrible as most places describe it. It was definitely odd, somewhat unpleasant, but not completely overpowering. I found it similar in strength and quality to the smell of expensive sulfur spring mineral water that you might find in many resorts. 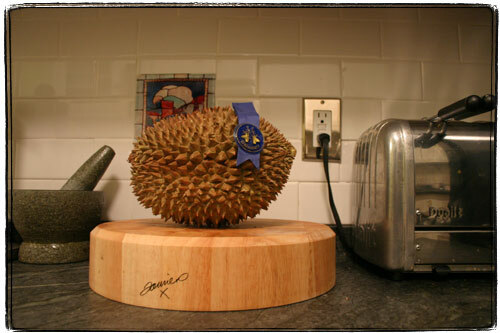 Nothing even close to the horrors that you might find in any article describing Durian on the web. The taste and texture of the fruit flesh was absolutely great. It had the texture and sweetness of a creamy custard, very smooth and buttery, tasting somewhat like pineapple, lemon and banana at the same time. It was very sweet, but not in a nauseating way. An absolutely unique taste, very, very exotic. I can also happy to report not having any gas or any other digestive problems widely reported as associated with the fruit in question. On the other hand I did not eat the entire thing as I am still trying to watch my carbohydrate intake. Apparently picking Durian is sort of a hit and miss experience. I had the most expensive kind my store had, an 89 cent/lb Mornthong variety. There are other varieties that are maybe stronger smelling and of lesser quality.